Disclosure: This post contains affiliate links. This means that I will be paid a commission if you click them and sign up for the Peapod delivery service. This will come at no cost to you, but it helps me keep the lights on at Poet in the Pantry. Peapod did not pay for or endorse this post. I had a rough winter. I was sick with at least five different illnesses, including “potential mono,” sinusitis, and the flu. This meant I had a lot of down time when I couldn’t manage the household duties. I was worn out, anxiety was a little higher than usual, and I felt crushed by the weight of all I could not get done. So I outsourced. 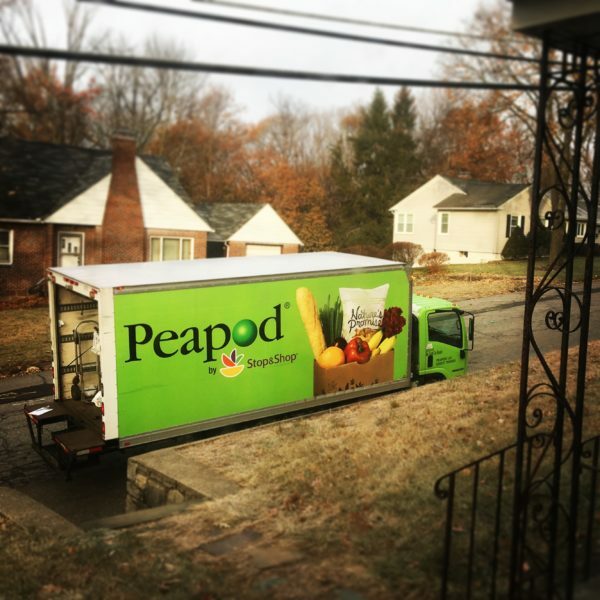 Faced one Friday with empty cabinets and no will to live, I placed my first Peapod order. It changed my life! Bloggers are prone to hyperbole, I know. I’m certainly not innocent of this. But here’s the thing: most of my panic attacks occur when I’m in the grocery store. They persist, despite ongoing cognitive behavioral therapy and anxiety medication. Sometimes, just the thought that I might have a panic attack is enough to get one started. So the opportunity to get all the food we need without stepping foot in one of these beasts is a blessing for me. The day of your delivery, Peapod will send a text and/or email letting you know a narrowed down window of when the driver will arrive at your house; an additional text/email is sent when you’re the next stop. I have found that they’re exceptionally prompt and, sometimes, even early. Keep that in mind if you’re planning on a 6AM delivery. You may want to splash some water on your face and grab a robe! When the driver arrives, they will pick your order from the truck and bring it to your door. My drivers seem to subscribe to the same philosophy I do with grocery shopping–the fewer trips to the door, the better. They will deliver your groceries wherever you want. Initially, I had them drop off in the kitchen, but it kind of weirded me out, so now I just stop at the door. I don’t mind taking everything the last 10 feet. The driver will let you know if anything you’ve ordered is sold out. This does occasionally happen. When you’re placing your order, you can choose whether you want substitutions or not for sold out items. You’re never charged for something that isn’t available. It’s a little irritating if you absolutely NEEDED the item that doesn’t arrive, but it’s a small inconvenience. Most of the time, I get everything I order. This has become the best budgeting tool in my arsenal. I can easily see how much I’m spending before I check out, so I can adjust items in my cart accordingly. I’ve never been very good at that while shopping in a grocery store. No embarrassing requests to remove an item after the cashier has tallied it all! I can copy my last order into the cart for the next, so after the initial set-up, it’s very quick and easy to complete an order. Peapod also keeps track of the items you regularly order, which you can reference for easy reordering or checking on specials for the things you use. You can shop any time of day. Wake up at 2AM and remember you’re out of sugar? Add it to the cart! Grab the last bagel on your way to work? Add it to the cart! It’s perfect for busy lifestyles. No parking lots!!! One of my anxieties involves parking lots and finding the perfect space. I put more thought into this than most, I’m sure, but it’s my thing and I’m okay with that. What’s even better, though, is not having to run the parking lot battle plans through my head at all. My car is safe and secure in the garage–no worries! You can still use coupons–and they double them! On top of the specials already offered through the app, drivers will take manufacturers’ coupons, which are then credited to your account for future orders. You have to plan ahead. There’s no same-day delivery and right now, at 3PM on a Friday, I can’t get a Saturday delivery, either. Most of the time, 24 hours is sufficient, but that means no last-minute additions to your order. I have to make sure my house is somewhat presentable. I don’t often have people over and there are four of us, plus three guinea pigs. My standards have been…lowered by having children. I worry sometimes that the drivers are judging me. I’m sure they’ve seen worse, though. After the initial trial period, you will have to pay for deliveries. Peapod rewards you for larger orders with a cheaper delivery fee, but you’re still going to pay. It’s $9.95 for orders $60-$100 and $6.95 for orders over $100. (The minimum order is $60.) There is also a fuel surcharge added on top of this, which, as of today, is $0.20. When you add that to the tip, it starts to get a little pricey. Pick-up is much cheaper at $2.95 and no tip, but then you have to drive there, park, hope nobody dents your car, etc., etc., etc. I don’t see the advantage. That’s hard for me to say. Most weeks, I would say it is. When I try to go rogue and shop in a store again, I find myself spending way more than I wanted to and I invariably buy things I didn’t need. Peapod certainly limits the impulse buys. The trade-off is that you also miss out on new products. With the tunnel vision of placing your regular order, you may not wander over to the New Arrivals screen. And without the opportunity to touch and see them in real life, they may not be as interesting to you. That said, I found Peapod to be invaluable when I was sick. And also when my anxiety made it difficult to go out in public. Also on weeks when I was too busy to deal with an hour or so strolling around the grocery store. And let’s not forget–waiting in line for checkout can make you feel like you’ve lost years on your life. 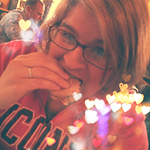 There is definitely a place for Peapod in my world, even if it’s not every week. Interested in trying out Peapod yourself?